This is one part of the vehicle that most people rarely think to clean. 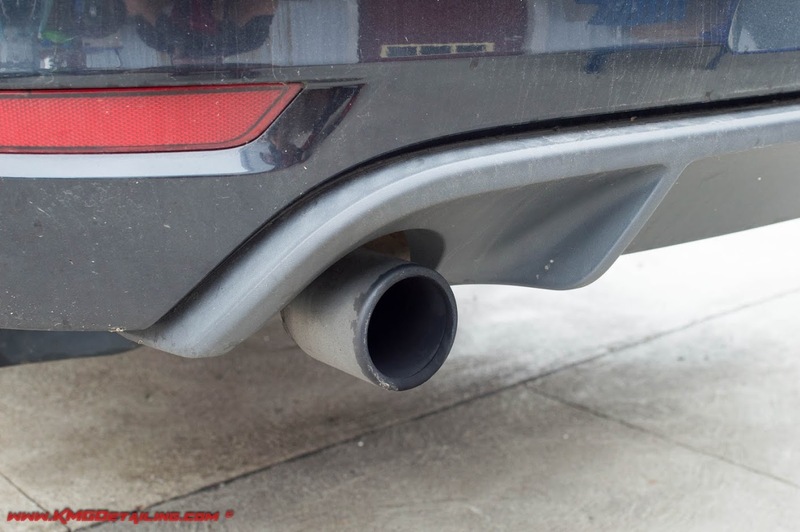 Chrome exhaust tips come on a majority of newer cars or people have modified their exhaust setup to an aftermarket system that likely has chrome or polished exhaust tips. If not cleaned regularly you will begin to get carbon build-up on the tip which will eventually turn them black. On most performance cars this actually happens quite quickly. Here is a quick way to clean your tips and apply some protection to make future cleaning easier. The process is quite simple, but can be messy. It is a good idea to wear a pair of gloves, such as the black latex gloves available from DI. Spray the exhaust tip with Stoners Invisible Glass and take a piece of Steel Wool and simple polish the surface. This will remove the carbon build up pretty quickly, however, if really dirty you may need to repeat this process 2 or 3 times. Once clean I like to give the surface a quick polish by hand with a light metal polish to make the chrome pop. Love me some #0000. Works wonders when paired with metal polish as you describe. #0000 works wonders when cleaning chrome or even for glass. Something every detailer should atleast have on hand. Thanks Paul and yes invisible glass works amazing for cleaning chrome. So what are your recommendations on black finished pipes like on mt 335is or CF decorative ring finishers on some after market exhaust tips? #0000 and a metal polish are my “go to” products when doing chrome exhaust tips. Great simple techniques, Kevin! Thank you for sharing. Stoner’s Invisible Glass also works wonders on bug guts on the car paint. Spray it on wait 30 seconds and wipe off. I love that stuff!